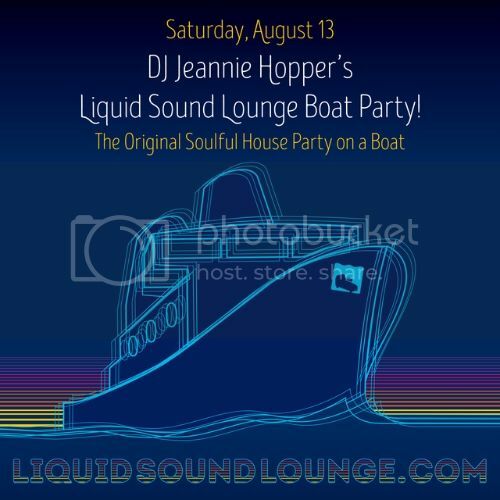 LIQUID SOUND LOUNGE SOULFUL HOUSE MUSIC BOAT PARTY!! O.G., est. 1999! Highly anticipated annual affair going back to 1999, and we haven't stopped partying like it's 1999 since... we are party purple people. Aboard The Cabana - East 23rd Street Marina, E. River. -Credit cards accepted at the bar on board. LSLs radio ambassadors include your DJ/host Jeannie Hopper with Co-hosts Steve Marshall & Reggie Johnson airing Saturdays 7-10p, WBAI 99.5fm. New York's longest running prime time radio show supporting independent artists producing soul infused grooves from down-tempo to house and featuring cultural insight with on going interviews and spotlights including Roy Ayers, Bluey of Incognito, Louie Vega, Chaka Khan and so many more since the shows inception in 1993 and reads like a cultural whos who on the soulful music scene. LSL annual boat cruises have been rockin' the waterways since 1999 along with on-going community building super dance parties connecting socially conscious party people with a purpose including the new LSL series Dynamite Dance Party that takes place in secret locations at private lofts deep in Brooklyn. DJ Jeannie Hopper has rocked dance floors in over 20 countries, and is a staple in New York. Her style is described as "soul infused grooves of all persuasions" bringing super soulful house grooves from funk, afro, groovy and laden with rich vocals. Shes DJed at so many of the pivotal cultural driving clubs as the Tunnel, Cielo, Santos Party House, New York Dance Parade, Twilo/Spirit, Pacha, Limelight, and oh so many more. Her record label under the same name has released several spoken vocals she writes and performs as well as collaborating with other labels, producers and DJ's including Louie Balo, Tedd Patterson, Victor Simonelli, Pete Heller, Deep Dish and more. The one and only having created the foundation of underground parties back in the 90's such as Afterlife and much more! Recently booked to DJ Spike Lee's Prince Born Day Purple People Party with Timmy Richardson.